Do you feel self-conscious because of missing teeth? While we often don’t realize how important our teeth are when we still have them, this can become painfully apparent once they’re gone. Missing teeth can have many negative effects on your oral health, including jaw bone loss, difficulty chewing, shifting teeth, speaking issues, and a higher risk for cavity. The good news is that many of these problems can be addressed through Main Line dental implants. The sooner you seek this treatment after losing the tooth, the better your chances of maintaining your long term oral health. Below are a few reasons why we consider Main Line dental implant therapy among our top restorative treatments at Penn Dental Family Practice. A dental implant has the look, function, and feel of a natural tooth. A tooth implant is strong enough to give you an unhindered chewing experience when you bite down. When compared to dentures, implants provide more stability by creating a firm support for false teeth. Once attached to the implant, a prosthetic tooth cannot move or slip around in the mouth— this is a very important benefit for eating and speaking! The success of the dental implant has made it a preferred strategy for managing the effects of lost teeth. According to the Journal of Oral Implantology, dental implants have a 95-98% success rate. To be considered for this surgery, you must have sufficient gum tissue and bone to anchor the implant in the jaw. Smoking nearly always has a negative impact on the outcome of an oral surgery. Gum recession and jawbone loss may not necessarily indicate that dental implants are out of the question for you. Based on your history, age, bone quality, and other factors, a Main Line implant dentist can determine whether you are a candidate for the procedure. For many people, a dental implant will last the rest of their lives. If you commit to taking care of the implanted tooth and surrounding gums through daily brushing and flossing, you’ll maximize your chances of keeping the implant for life. Regular follow-up visits to the dentist are also essential. The long lifespan of a dental implant as compared to dental dentures, comes with a special advantage: a one-time cost. By comparison, even the best dentures on the market have to be replaced every five to seven years. From a health perspective, a dental implant is the superior option in restorative dentistry. Anytime teeth are lost, a gradual process of bone loss begins to occur. The presence of the implant actively works against these degenerative forces by stimulating growth in the jawbone naturally. This process has an aesthetic effect as well. By stabilizing the jaw, the implant will prevent you from experiencing the sagging effects of bone loss. In other words, the implant helps maintain a normal facial appearance! A dental implant provides a level of permanence that can’t be achieved with any other restorative treatment. Imagine the convenience of having a set of permanent, stable teeth that won’t wiggle around or break. No one will be able to tell that you were ever missing a tooth. Your implanted tooth, of course, will look like all your other teeth. Natural, beautiful, and perfectly fitting— these are some of the reasons why our Main Line patients love their dental implants! Get Your Main Line Dental Implants With Us! Penn Dental Family Practice provides hundreds of dental implantation surgeries to our patients each year and consistently delivers excellent results. Patients choose our practice because of our reputation in the area as an outstanding dental services provider. Our team is comprised of faculty members at the University of Pennsylvania School of Dental Medicine, where we teach the next generation of dentists the best techniques used in the dental field today. 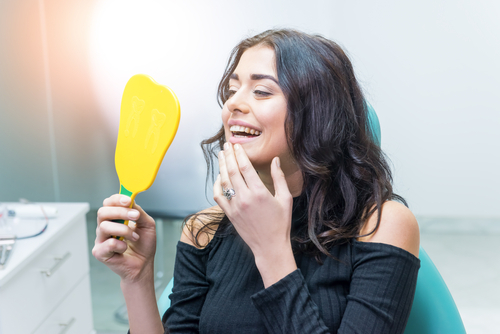 If you’re interested in learning more about dental implants and whether you could be a candidate for this procedure, please schedule an appointment with a prosthodontist at Penn Dental Family Practice. You can reach us by calling 215-898-7337.